What is Minit Stop Rewards? It is a customer appreciation program. 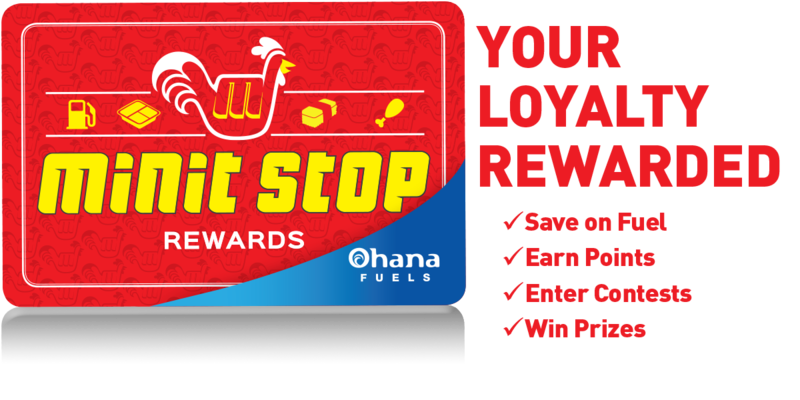 When you make purchases at any Minit Stop location, you earn instant savings, redeemable points, and chances to win valuable coupons and prizes. Is the Minit Stop Rewards card free? YES. It is totally free! Not only that, but you are rewarded every time you make a qualifying purchase at any of our convenient locations. To join Minit Stop Rewards just go to any Minit Stop location and pick up a FREE card. Register your card at any Minit Stop location to become eligible for instant price rollbacks on fuel, special discounts, and contest enrollments. You can register your card by submitting your registration form to any Minit Stop cashier. Your account balance appears on your receipt any time you make a purchase at Minit Stop, or your can view your preview your point accumulation by clicking here. points are updated daily. In order to redeem your points, you must first register your card. Inform the Minit Stop cashier that you would like to redeem and use points for your purchase. You can then swipe your card for instant redemption (card must be presented for points redemption). Your rewards are that easy! What benefits & prizes am I eligible for? Receive an instant price rollback on fuel* every time you insert your registered card at the pump or present it to the cashier. Earn bonus points on fuel when paying in cash. Win instant prizes at the point of purchase. Become eligible to participate in great prizes, giveaways, and contests. Automatic enrollment in our Coffee Club and Deli Sandwich Club programs. Learn more about contest and prices. For information on current promotions or contests please visit any Minit Stop location or log on to www.minitstop.com/rewards. *HFN transactions do not qualify for price rollbacks. Join Minit Stop Rewards to take advantage of in-store savings and promotions. **Some restrictions apply and terms are subject to change without notice. Products that are not eligible to receive points are tobacco, liquor and phone card products. However, you can redeem points for any and all products sold by Minit Stop, including fuel.